Do you want to watch the video that is converted from PPT? 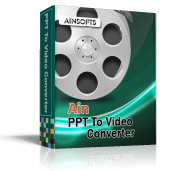 PPT to Video Converter will help you convert your PowerPiont(PPT) files to almost popular video formats such as AVI, MPEG, MP4, WMV, MOV, FLV, 3GP, etc. So you can watch your PPT files on more devices like iPod, Zune, iPhone, Apple TV, PSP, Pocket PC. Its operation methods is easy for newbie and everyone can master it quickly and operate it skillfully. Adjust setting of output video. Set the size and quality of output files such as video size, video quality so that it play best for you. You can load many PPT files you want and convert them in batches. This PPT to Video Converter supports PPT made by Microsoft PowerPoint XP，2007 and above. It can shutdown your computer automatically after conversion finished and preview the PPT files before converting.